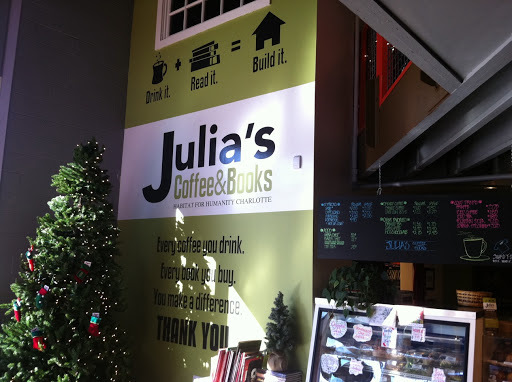 There is a non-profit coffeehouse in Charlotte, NC that is making a huge difference in the lives of families all across our city. It’s called Julia’s Coffee. All profits from this amazing coffeehouse go directly to Habitat for Humanity’s effort to build homes for families in need. Julia’s has an incredible vibe. About 400 square feet is dedicated wall to wall with books that have been donated. The remaining floorspace of approximately 700 square feet is dedicated to the espresso bar and lobby. A unique twist on coffeehouse seating is on display as they built a balcony-styled seating area that has room for 15+ people that overlooks the libary. Great space to do meetings or study on your own. I love Julia’s Coffee. And it’s a great working model for us as we continue to move forward with the development of Ebenezers Coffeehouse in Uptown Charlotte. You can follow our progress on Twitter (@ebenezersCLT) as we continue to take steps forward each day as we move toward acquiring property in Uptown and seeing this vision come to pass.